Marcel Broodthaers: Invitation to a Voyage, the first comprehensive survey of artist’s publicity by Marcel Broodthaers (1924 – 1976) consists of hundreds of rarely seen artist’s exhibition announcements, manifestoes, posters, advertisements, hand-outs, press releases and open letters conceived and distributed during the Belgian conceptualist’s brief but intensive artistic career (1964 – 76). The exhibition opens at Alden Projects™ on March 05 (12:00 to 6:00) and runs through May 15, 2016. This is no ordinary publicity. Drawing from an unparalleled archive, Alden Projects™ unpacks scores of never previously exhibited material, virtually all of which is entirely absent from concurrently running Marcel Broodthears exhibitions in New York. Proposed as a vital supplement for these other surveys, this exhibition curated by Alden Projects™ Director, Todd Alden provides a specific and nearly comprehensive local map of Marcel Broodthaers’ exhibition network, frequently printed not in the familiar fonts preferred by his fellow Conceptual artists (e.g. typewriter), but in 19th century script fonts with cryptic designs announcing his very particular discourse network. (Warning: this material is opaque, programmatically contradictory, and challenging to apprehend.) Unfolding according to the artist’s shifting designs are the manifold exhibition announcements, publicity, press releases, and other language-based open letters, for example, issued by the artist’s own fictional Musée d’art Moderne, founded in 1968 and closed in 1972 (“Museum for sale due to bankruptcy,” according to the artist’s poster in this show published by the Artworker Star, Amsterdam). As an artist who dedicated an entire section of his fictional museum to publicity—one “wing” is titled “Section Publicité”—it stands to reason that the publicity that the artist conceived relating to own fictional museum (as elsewhere)—the invitations, the press releases, the advertisements, the open letters, etc. were not conceived as conventional supplements or as simple documentation—in other words, they were not addressed as elements to be understood separately from, and external to the “proper” works of art in the artist’s museum--but rather, this artist’s publicity, these performances in script were also very pointedly conceived, addressed, and distributed as integral elements of Broodthaers’ proper work too. It is extraordinary that prior to this exhibition, so much of this material has remained unregistered and little considered. As an ex-poet formerly associated with Belgian Surrealism, Broodthaers made art about shifting alphabets, and the latter was sometimes associated with literary inspiration: purloined letters, messages in bottles, and industrial poems to name only a few (the alphabets of Baudelaire, Poe, and Mallarmé were like clay for the artist). The title of this exhibition is partly inspired by a poem by Baudelaire, the translator of Poe to whom Broodthaers dedicated multiple books of his own work. Like a message in a bottle, all of the material in this show was conceived and freely disseminated by the artist (or by his associates) at his behest, mostly in tiny quantities to handfuls of fellow artists, curators, and art lovers comprising the paltry mailing lists and audiences to whom these astonishingly original, deeply perplexing, and surprisingly complex messages were once destined. In his publicity and open letters, modes of address are constantly upended and shifting. The political form of the open letter held persistent interest for the artist, and most of the letters here were responses inspired by the changing cultural and institutional events around May, 1968 in which Broodthaers was directly involved. 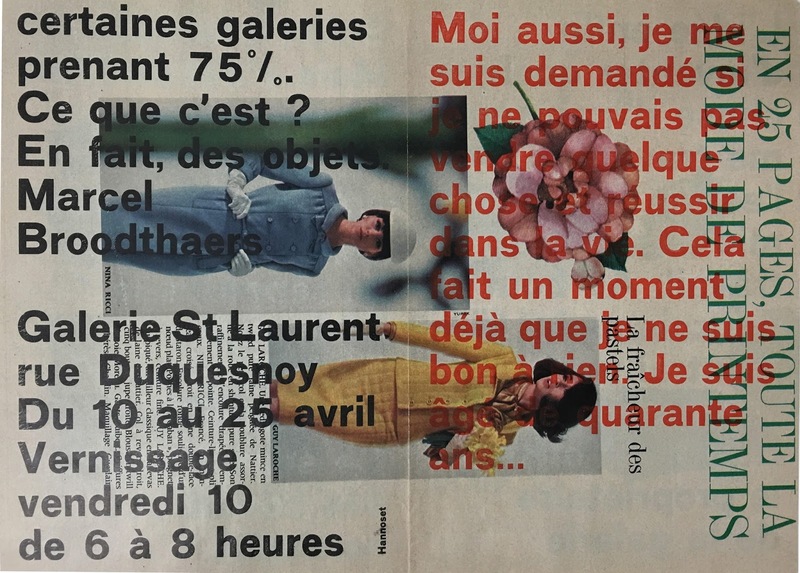 The first open letter from June, 1968 addressed “Cher amis,” speaks about Broodthaers’ own negotiations between the occupiers and the Palais des Beaux Arts in Brussels (as well as announcing sympathy for Andy Warhol who was shot in New York the previous day) while others are addressed to particular artists, including Joseph Beuys, a colleague whose messianic, mythopoetics troubled Broodthaers. One letter is a delightfully absurd, allegorical missive, comprising a letter transliterated into Broodthaers’ own hand-writing, but supposedly found by Broodthaers himself “in a dilapidated Cologne tenement” which the Belgian attempted to pass off as having been written by the composer Jacques Offenbach to Richard Wagner; this cockamamie, yet hilarious epistolary conceit is a component of Broodthaers’ open letter to Beuys and can be understood as an allegory about the relationship between art and politics (an original, English language version is present at Alden Projects™). It is admittedly challenging to come to terms with Broodthaers’ open letters as well as his other opaque, language-based communications and art. This exhibition proposes to begin by grapping with the very particular and peculiar ephemeral forms and historical modes of address to which Broodthaers dedicated so many artistic acts of transliteration, re-visitation, and performative script: artist’s publicity; the invitation; the hand-out, the advertisement, the open letter, among others. This exhibition sets out to map the very particular places and the very particular times in which Broodthaers’ work originally functions and some of the very particular people, events, and conditions to which his work so pointedly responds, addresses, and invites us to consider. Then as now, it is an invitation to a voyage.